A Continuous Glucose Monitor is a small device worn under the skin that uses interstitial fluid to monitor blood glucose levels. It then transmits readings to a receiver and allows a person with diabetes to have a guide to what blood glucose levels may be at a given time and whether they are expected to rise or fall in the near future. What is the difference between a CGM and finger stick? What is the difference between traditional glucose testing and using a Continuous Glucose Monitor? Glucometers are portable devices that read glucose levels from a blood sample that is placed on a tiny test strip. Test strips are discarded after a single use. Some meters store a limited number of glucose results in memory. The results can be downloaded into a computer. A glucose sensor, on the other hand, is a tiny electrode that is inserted under a patient’s skin (subcutaneous tissue) that continuously records glucose levels around the clock. The sensor is worn for between three to seven days before it is discarded and replaced by the patient. Glucose readings are transmitted to a monitor, smartphone or insulin pump where the values are displayed. Trend reports and charts can be viewed after data is downloaded to a computer. The Dexcom G5® shows where your blood glucose is, where it’s going, and how fast it’s getting there. This Continous Glucose Monitor only requires calibration every 12 hours (if you feel that the CGM reading is off, always refer back to your glucometer reading however). The Dexcom G5® Mobile is approved for adults and children 2 years and older. to your device as well as can be shared with loved ones for added protection. Transmitters are warranted for 3 months from the time they are shipped. Sensors are to be changed out after 7 days. The Dexcom G6® is the most updated version of the Dexcom® CGM. This product also uses Bluetooth technology but now has sensors that last 10 days. This sensor is water-resistant. It no longer requires calibration but users can still choose to enter a calibration if they would like to or feel that the sensor seems inaccurate. The Dexcom G6® still requires a 2-hour warm-up period. The “urgent low soon” alarm will alert the user when blood glucose is dropping rapidly and is expected to cross the low threshold. It also has a new easy-to-use, push-button applicator that is said to be less painful than the G5 insertion. The sensor will last for 10 days and will no longer be bothered by acetaminophen use. It continues to work with smartphones, as a standalone device, and with the latest US version of the Tandem insulin pump. *While the Dexcom G6 has been approved by Health Canada for sale, this product is not expected to be available on the Canadian market until the last quarter of 2019. 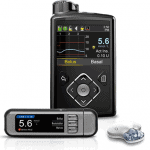 This CGM system also offers real-time glucose monitoring. It wirelessly sends glucose readings to the insulin pump every 5 minutes. Sensors should be changed every 6 days. Flash monitoring systems do not continuously transmit readings to a monitor, smart device or insulin pump. Readings are transmitted when the system reader is passed over the receiver. This system is convenient and discreet. It requires no calibration. With each scan you get the current glucose reading, the last 8 hours of glucose data and an arrow showing the direction glucose readings are heading. These sensors are also safe to wear in the pool or shower. 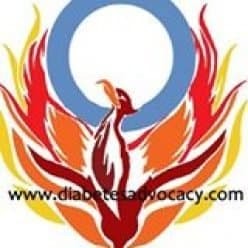 Libre does not currently work with any insulin pump. Download a detailed comparison of CGM and Flash Meters available in Canada here.